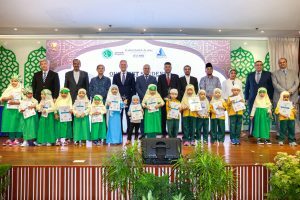 On Saturday 6 October 2018, Jamiyah Education Centre (JEC) held its Little Huffaz Graduation Ceremony and launched the Arabic Language Workshop programme in collaboration with Kafrelsheikh University of Egypt at Jamiyah Headquarters. 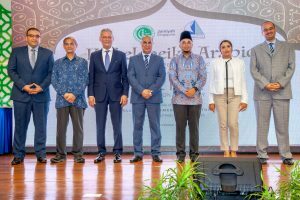 The event was graced by Guest-of-Honour, the Ambassador of the Arab Republic of Egypt to Singapore, His Excellency, Mohamed Ahmed Fathi Abulkheir and diplomats from the various foreign diplomatic missions in Singapore. 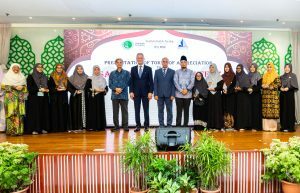 Mr Rafiuddin Ismail, Secretary-General of Jamiyah Singapore, and Dr Hussin Mutalib, Chairman of JEC, were also present together with around 200 guests. Dr Hatem AWS Alansary and Dr Mohamed Ibrahim Ahmed Elshafey from the Kafrelsheikh University will be conducting the workshops at Jamiyah Education Centre (JEC), Level 4, MDIS Building, 190 Changi Road from 7-13 October 2018. Little Huffaz is a 3-year programme which provides systematic training on Quranic memorisation with techniques and proper recitation of the Quran for children aged from four to six years old and is available at four centres: Jamiyah Kindergarten, Little Huffaz Brainy Bunch Hougang, Little Huffaz Brainy Bunch Pasir Ris and Jamiyah Child Care Centre.